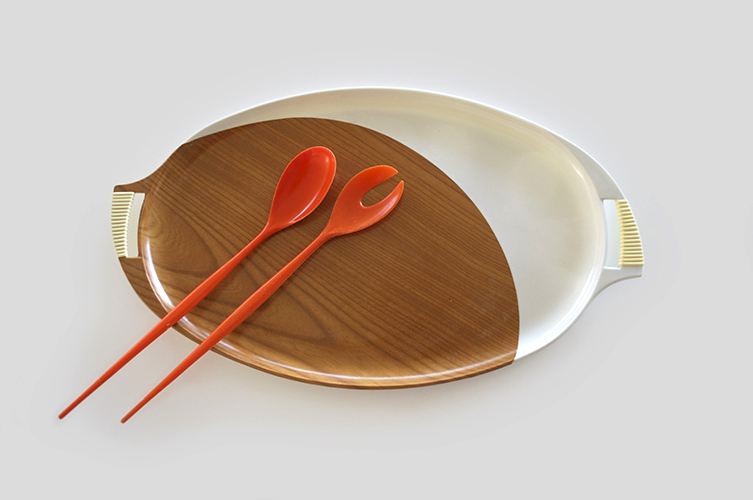 Sadly not 1956 iconic Danish designed Herbert Krenchel Krenit salad servers. They’re 1970s Decor plastic made in Australia. Replica but vintage. So what’s vintage? 20+ years is the general consensus. Being old isn’t enough to make something valuable, but it does help. Observe the Zoo Line Kay Bojensen ‘inspired’ AKA knock-off teak monkeys circa 1950s, now selling for almost the same price. I doubt these cute orange plastiques will ever appreciate that much in value but until I feel comfortable paying in the vicinity of $75 for a pair of the original salad servers [which is probably never] I do appreciate their useful good looks. I’m quite fond of old Decor, [but not as much as this guy] and the deceptively cool, genuinely retro faux bois [fake wood] Japanese tray. Fake it til you make it? What do you think of replicas?